The genus Ramonda was published by L. Richard ex Persoon in 1805 as Ramonda pyrenaica but synonomously published as: Myconia Lapeyr. (1813), non Neck. (1790), Chaixia Lapeyr. (1818), Lobirota Dulac (1867), Ramonda Caruel (1894). Remarks: “myconi” is pre-Linnaean phrase name term: Also published as “Auricula ursi myconi” in Historia generalis plantarum, Jacques Daléchamps 1587 (p. 837). What does this all mean … the species that we know as Ramonda myconi may be the earliest member of the gesneriad family to have received such serious scientific consideration, most likely as a herb in the 16th century, albiet with another identity. Description: Subacaulescent rosette plants. Leaves alternate, radially spreading, (sub)sessile or with short winged petiole, ovate-spathulate to elliptical, obtuse, margin coarsely crenate-dentate, rugose, with ferrugineus hairs on lower surface. Cymes axillary, long pedunculate, flowers few, 5- to 4-merous, bracteoles absent. Sepals free, oblong-ovate. Corolla flat-faced, rotate, lobes elliptical-obovate, obtuse, lilac-blue, mouth whitish, with a conspicuous orange-yellow ring. Stamens 5 or 4, equaling the number of corolla lobes; filaments short, anthers large, ovate-triangular, with parallel thecae, not coherent, but ± forming a cone, opening apically. Nectary absent. Ovary ovoid- conical, style slender, much longer than anther cone; stigma small, capitate. Fruit a dry ellipsoidal-oblong capsule, dehiscing septicidaly. The chromosome number 2n=48, ±96. There are three species; Ramonda myconi (Reichenbach) is described as a species with an exceptional persistence despite drastic alterations in the environment. Flowers are produced from May to July and are hermaphroditic, self-compatible but not capable of autopollination and are mainly visited by bumblebees and syrphids. , Ramonda nathaliae (Pan. & Petr). and Ramonda serbica (Panc.). Geographic distribution is the Pyrenees and adjoining mountains in north-eastern Spain and the Balkan peninsula. The plants grow in rock crevices in shady and humid areas, at elevations of 50-2800 meters (165-9200 feet). Skog, L.E. & J.K. Boggan. 2005. 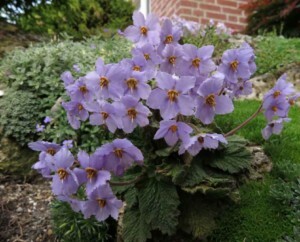 Bibliography of the Gesneriaceae., 2nd edition: http://persoon.si.edu/Gesneriaceae/Bibliography. Weber, A. and Skog, L. The Genera of Gesneriaceae, 2nd edition 2007, http://www.genera-gesneriaceae.at/.